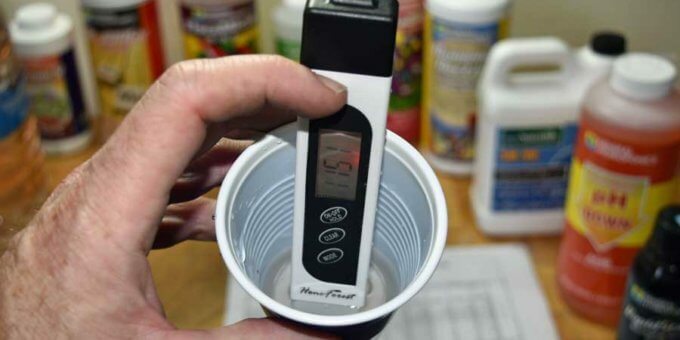 Managing the Electrical Conductivity (EC) of the water that is available to the plants is a key practice to maximize the speed of growth and yield of the harvest. We explain the importance of EC in “The Principles of Fertigation” and “Understanding Osmosis and EC”. In order to manage EC, you need to set EC targets for the nutrient solution that will be available to the plant. Just as the nutrition needs of a plant change during its life cycle, its optimal EC range also changes: starting low, reaching a peak during late bloom, and going down sharply at the end. In the chart below, you can find general guidelines for optimal EC at different life stages, however, there are differences between different nutrient lines. Therefore, you should start with the recommendations from your supplier. However, if the supplier recommends EC ranges that are significantly higher than these general EC ranges, I would recommend finding a different supplier. In particular, you should avoid nutrient lines that recommend high EC ranges and frequent flushing. The EC that matters is the EC of the nutrient solution suspended in the coco at the root zone. However, you can only measure the EC of the inflow and the run-off. 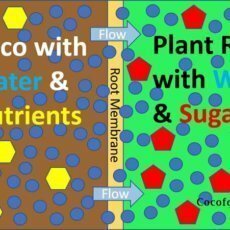 The run-off EC is the best proxy for the EC of the nutrient solution in the coco. For this reason, your main task is maintaining the run-off EC within the acceptable range. Nutrient companies should provide you with both a set of recipes in a feed chart and a set of EC or PPM ranges for each stage of growth. The general ranges provided above are appropriate for General Hydroponics Flora Series. If EC or PPM ranges are not provided, you should use the general ranges recommended above. When calculating your target inflow EC, you need to start with the low end of the recommended range. When considering the target EC for your nutrient solution (inflow), you need to understand that the EC will rise between fertigation events. As described above, water is removed through transpiration and evaporation faster than salts are removed. This causes the EC of the nutrient solution suspended in the coco to rise between fertigation events. Therefore, the target for the EC of the inflow is always lower than the maximum acceptable run-off score. As I discuss in more detail below, you are always working to maintain EC within about a 300-point range. Inflow is added at the bottom of the range and run-off is kept from exceeding the top. You need to start by setting a target inflow EC value, but your real goal is keeping the run-off value from exceeding the maximum. Convert all values to microsiemens of EC (values in the hundreds and thousands). You can convert back later if needed. 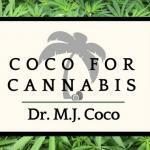 Add and subtract EC for each of the 5 variables below based on the particulars of your grow. Do not adjust the target more than +300 points. Calculate your total adjustment, but if the total you calculate is more than +300, limit your actual adjustment to that. Listen to your plants! 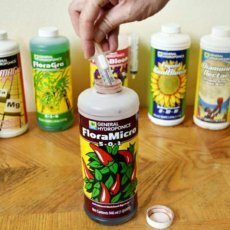 Your plants know better than anyone what EC they prefer. Make any changes slowly and always verify that your plants approve of the change! 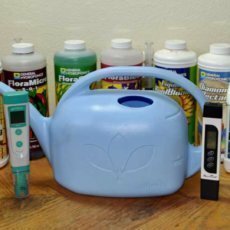 You may or may not be able to use untreated tap or well water to mix your nutrients. The key consideration is the EC. Starting water must be lower than EC 300. The lower the initial EC the better. Using distilled water or water filtered through reverse osmosis is best. However, tap and well water may be used if they start less than EC 300. Starting with good quality (low EC) water: No adjustment needed. Starting with good quality (low EC) water is assumed. If you are starting with low EC water, the bulk of the EC will come from the base nutrients. If the starting water already has a high EC, you should adjust your target to account for the EC of the starting water. For example, if the EC of the starting water is 150, then your EC target for the nutrient solution (inflow) can be adjusted by +150 points. Water that starts with an EC of more than 300 should not be used. As water transpires from plants and evaporates from pots it causes EC of the remaining nutrient solution to increase. If you are unable to fertigate frequently, then it will be harder to maintain a tight range between inflow and run-off EC values. High frequency fertigation is the best practice. However, if it is not possible, you may need to lower the inflow EC so that the natural rise in EC does not cause damage to your plants. Remember that the run-off EC is the value that you need to control. Lower inflow EC until you can maintain run-off EC in the appropriate range. Heat and low humidity increase the rate that plants draw in water through their roots. 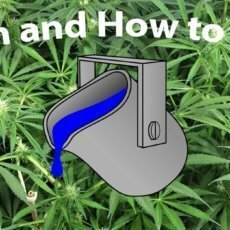 Lowering the EC makes it easier for plants to pull in all the water that they need. Both heat and low humidity also cause increased evaporation. The increased water that is taken up by the plant and the increased evaporation causes the EC to rise between fertigation events. Therefore, in addition to lowering inflow EC, you should also increase fertigation frequency. Always “listen” to your plants! Once you determine your target inflow EC and are maintaining the EC in your coco within 300 points, make sure that your plants are happy! If there are any signs of burn, and the run-off is not significantly higher than inflow, then your target EC range may be too high. Realize: Plants may be burned by abrupt changes, but they may be able to adjust to the new higher levels. Be patient if minor burn shows as you increase EC. Slow the increase and allow plants to adjust. At this point you are ready to determine your EC range targets for each stage of growth. Your main management goal is keeping the run-off value close to your run-off target. See our tutorial “How to Manage Run-off EC”. I like how you set safe ec targets. Great info here. Thank you for sharing.